Felines have a tremendous sense of smell and vision, but the new study by researchers at the University of Lincoln, UK, has for the first time investigated which sense they prefer to use under test conditions – and suggested sight may be more important than smell. 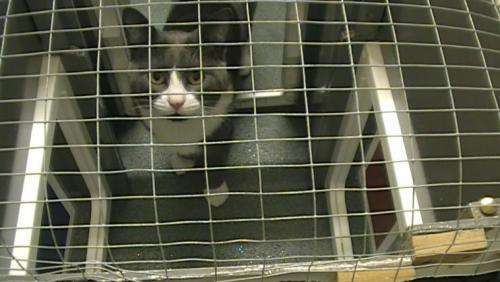 A group of six cats were placed in a maze which had 'decision' points – and the cats had to choose which avenue they took based on their preference for using images or smell. They were simultaneously presented with two squares of paper, each containing a different visual and odour cue. One combination of stimuli indicated they would receive a food reward, whereas the other led to no reward. Evy, who is now working at Battersea Dogs & Cats Home, explained: "Up until now we really thought that the sense of smell would dominate how cats view their world, but we are now reconsidering this and also the implications of how we manage them. At Battersea Dogs & Cats Home we make sure that our cats are housed in the best possible environment - one that respects the cat and provides each individual with whatever it needs in order to help it adapt to a rehoming environment. I was also particularly surprised by the speed at which the cats learned how to solve the task, which is very encouraging for future cat behaviour studies." Professor Daniel Mills, who supervised the study and is based in the University of Lincoln's School of Life Sciences, added: "We live in a complex world and use all of our senses to make sense of it. This is the first time we have asked cats how they operate rather than assumed this from what we know about their senses. Another important finding from this work is the individual variability - different cats had quite fixed preferences, and this may have important implications for their welfare. If there is a cat which has a strong preference for using its nose then simple changes in the smell of the environment might have a big impact on it, whereas, for others it may be insignificant. This work provides a unique insight into the important principles of attending to the needs of the individual rather than the population in general for good welfare." "Up until now we really thought that the sense of smell would dominate how cats view their world"
Now, that should have been investigated, rather than the patently obvious notion that cats prefer sight. Why did they think it was smell? How did they ever come up with that notion? My cat will go up to an empty dish that I just put down and smell it to determine if it has food. Thus, I do not think that sight is the primary sense used to determine the existence of food. anyone got a free copy to share? "now, i am not saying you are wrong, just pointing out that there is no logical means of extrapolating that your cat uses scent over sight just because it sniffs it's food dish"
Capt. since the food dish was very shallow and any contents would be easy to see, my guess is that my cat determines the existence of food by smell rather than sight. I agree that she sees the dish and get excited but the final determination is made by smell not sight. Also it is a well known fact that cats will not eat if their sense of smell is impaired by illness. OK....6 cats does not a statistic make. It's certainly something that can be used for formulating a hypothesis based on observation, but to get any kind of scientific value out of this they have to amplify their data base...a lot. I agree that cat hunting, which is a little different than locating food, is a visual and sound driven task. I have never seen a house cat track anything by smell as a dog does.